When Paul comes to, he manages to remove the handcuffs with a paperclip. Hayden wants Nikolas to sign the ELQ shares over to her or she&apos;ll tell the police that he tried to kill her. Nikolas claims she could still call the police even after he signs the papers, but Hayden says she would provide a statement otherwise. Nikolas calls her a greedy manipulator and is upset that she&apos;s blackmailing him. Laura arrives, so Hayden heads out, but not before reminding Nikolas to sign the papers. Ned is relieved to see that Tracy is feeling better. Tracy says she&apos;s feeling like herself again and is ready to start doing business. Tracy has Ned text Hayden to come to the hospital. Jason wants Nikolas to pay for what he&apos;s done, but Sam worries about Spencer. 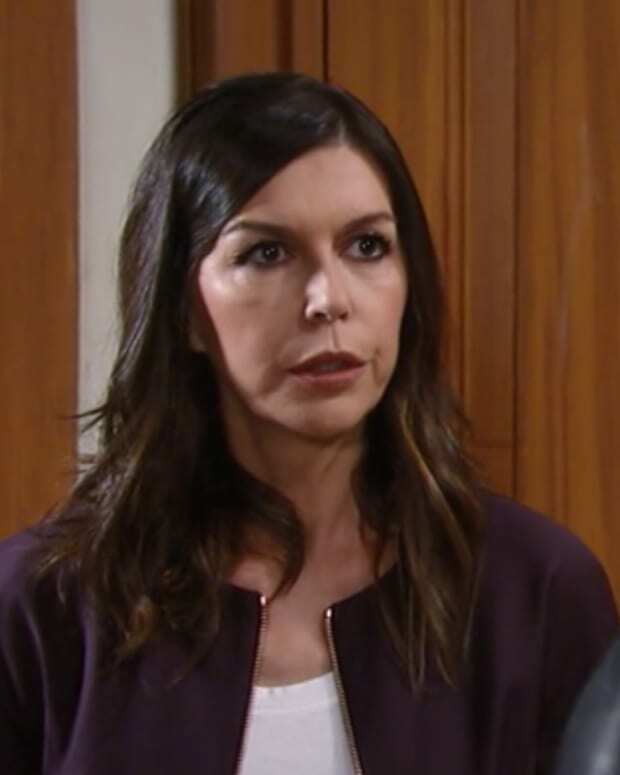 Anna wonders what Sonny plans on doing when they find Carlos. 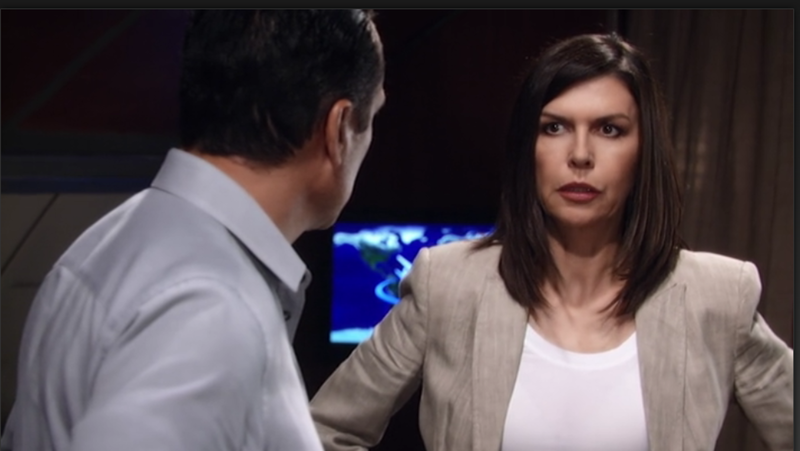 Anna says she wants him brought home to testify against Julian. Anna confesses to Sonny about shooting Carlos on the docks. She talks about how she felt like a law-breaking vigilante. Sonny sees nothing wrong with that and doesn&apos;t understand why she feels guilty. Maxie wants more information about Nathan&apos;s ex-wife, but he doesn&apos;t want to talk about her. Maxie promises to drop the subject, but later on she does an Internet search for Claudette. Nikolas explains everything to Laura and says he has no choice but to sign the papers. Laura realizes that her son is worried that she and Liz will be accessories after the fact. Nikolas makes a promise to Laura that everything will work out. Sonny and Anna land in Quito, Ecuador. Anna is detained by customs, who tell her there is a warrant out for her arrest. Sonny leaves to meet with his man on the ground to see if they&apos;ve located Carlos. Hayden meets with Tracy and tells her that Nikolas will sign over the ELQ shares to her. Tracy says she&apos;ll pay Hayden as soon as the stocks are transferred back to her. Hayden says she&apos;s changing the rules and keeping ELQ for herself. Tracy warns that she&apos;ll tell everyone Hayden&apos;s true identity and calls Ned into the room. Hayden introduces herself as Rachel, then tells Tracy she has no leverage on her anymore. Paul calls Anna to admit that he filed the arrest warrant to detain her. Anna wonders why he didn&apos;t stop Sonny as well, then realizes that Paul wants Sonny to find and kill Carlos. Jason and Sam head to Wyndemere to make Nikolas an offer he won&apos;t refuse. Sonny comes across Carlos, who pulls a gun on him.